God is always there wishing to reshape and remake and renew us; to make us into the beautiful people he intended us to be. Because of their wilfulness and greediness, because of their arrogance and tolerance of injustice and idolatry, God would need to break them down; otherwise they would never reach their potential as his chosen people. God would demolish them, not to throw them on the rubbish heap but to start once more from the beginning. Our God is an incredibly patient potter. 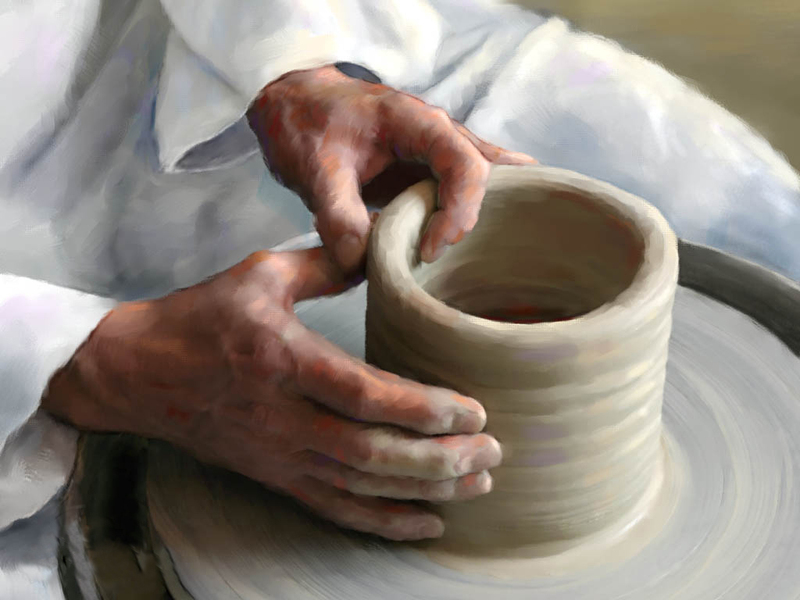 I would imagine that if any of us were to have a go at making a pot clay and the clay didn’t do what we expected it to do or because it was too wet or too dry or too crumbly we would lose patience, throw the whole lot in the garbage and get a fresh lot that might be more successful at being what we intend it to be. In fact, so intense is God in his plan to remould and remake us that he sent Jesus and the Holy Spirit to renew, remould and remake us. He forgives our weaknesses and flaws. In Jesus he even takes on the form of a lump of clay and becomes one with us and makes it possible for us to repent, to turn around, to be remade into what God intended us to be. It is the Holy Spirit who awakens in us the need to be remade and remoulded and leads us to look to Jesus as the only one who can do it. No matter what our age may be, or what the cause of our variety of ugliness might be, God wants to save us. God is a not a throw away God, but a God full of grace, a redeeming God, a God of love and power.